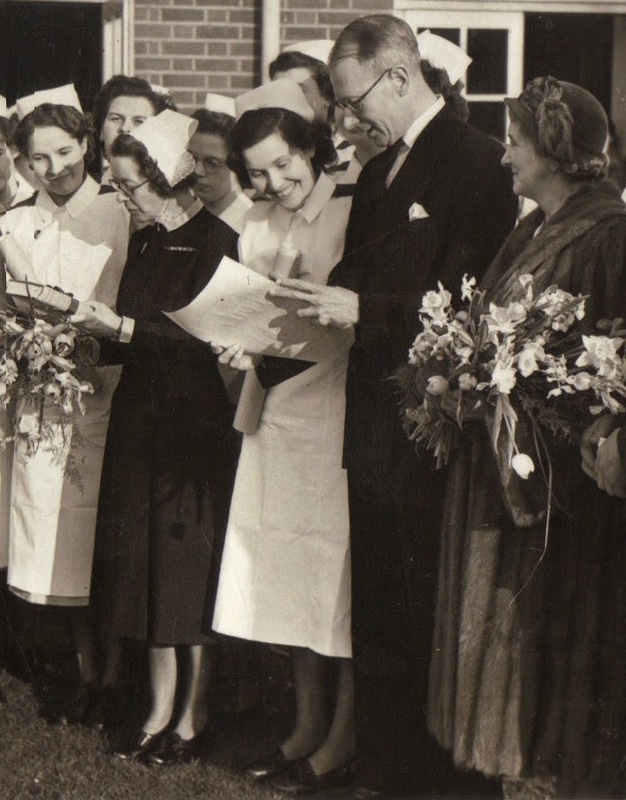 Erna Naughton (Nurse Ernestine Pirolt) 3rd from right at her graduation. Last Friday my close friend Erna Naughton passed away peacefully in the Isle of Man where this lovely Austrian lady had lived since the 60s. 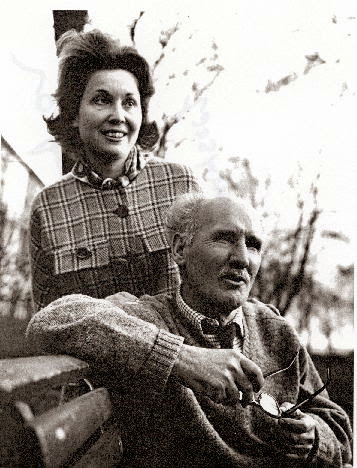 Erna was the widow of author and playwright Bill Naughton who was born in Ballyhaunis Co Mayo and moved to Bolton with his family at the age of six. I first met Erna in the mid 90s when I was living in Ballyhaunis, Ireland. Erna had travelled to Ireland from the Isle of Man for the Kenny/Naughton annual October weekend School, of which she was Patron. The school, celebrating the works of Bill Naughton and also that of P.D. Kenny, brought writers from all over the world, and Erna, after reading my book Marie's Voice (re-issued as With a Little Help from My Friends) wrote to me with an invitation to give a talk about my life and writing at the Kenny/Naughton School. From that day we became firm friends. 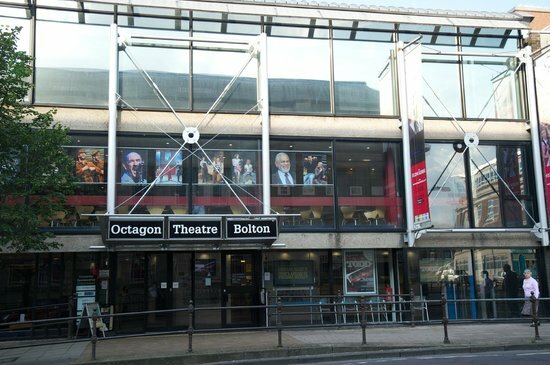 I stayed with Erna every year in the Isle of Man and in the last few years accompanied Erna to Bolton's Octagon Theatre where Bill's work is still celebrated today. Erna was such a gracious lady. She cared about everybody and was generous to a fault. I watched in awe as people flocked around her on those visits to Bolton, especially the children when we visited Bill's old school St Peter & St Paul. That Erna touched so many lives is a testament to who she really was. I was blessed to spend the weekend with Erna in Isle of Man three weeks ago. She was frail and I was saddened as I realised it was probably the last time I would see her. Her friends on the island (they'd probably kill me if I mentioned their names) rallied around her, dropping in meals and taking her to hospital appointments, so she was surrounded by love and support. She ate like a little bird and as a special treat I bought us some naughty fish & chips. Erna laughed at the size of the meal, ate the fish and typically saved half her chips for the birds. How she loved the birds..
My life is going to be so different without my friend - the letters, cards and parcels we sent each other, the phone calls that began with 'Michelle my deayar' and ended with 'Goodbye darling' phone calls that left me laughing for days... Now the phone will be silent and the postman will walk past but in my heart I have wonderful memories of Erna that I will treasure forever. Erna sent me the following updated piece last year to be included in a book I was embarking on. It has previously been printed. 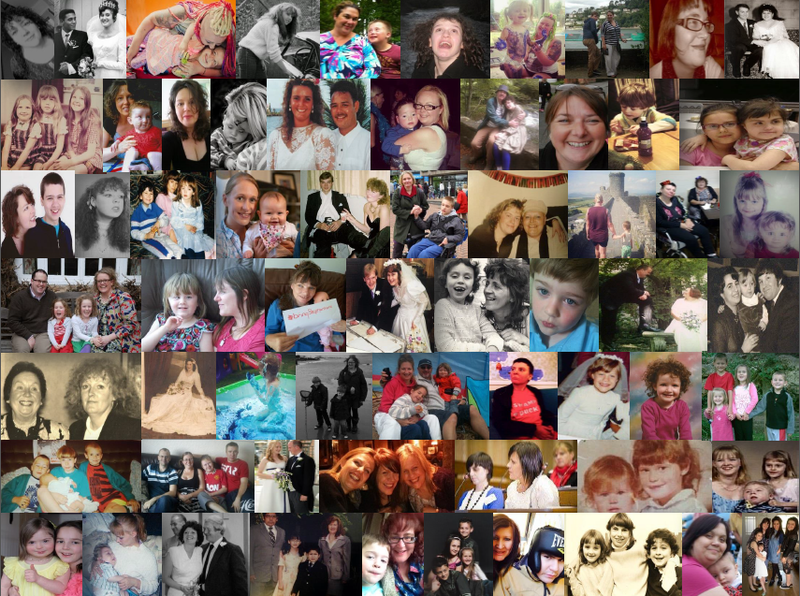 It is Erna's tribute to Bill and our tribute to her. "I am sure many of you have been wondering how I, a girl from Austria, came to marry a man from Ballyhaunis. Well I’ll tell you. It was after the war that I met a young air force man in Austria. After several months we intended to get married – he asked my mother (my father died during the war) to give her permission. 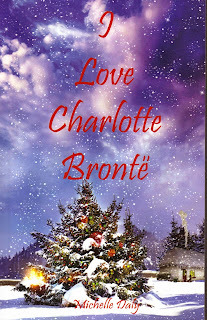 She thought I was rather young but, because she liked the man she gave us her blessings – he had to get back to England and I had to get my papers together, and after a long two night’s train journey I arrived in England two days before Christmas in 1947. All along the journey I felt that I was making a mistake – I wished the journey would never end. I had been warned by friends that England was not going to be what I was expecting. Already girls who had married men in Austria had come back home, often with children. I felt this could not happen to me. He met me at Victoria station. I was happy to see him, he was very friendly and I remember how impressed I was driving through London to the East end, seeing all the lights and the beautiful buildings. We arrived at his sister’s house where I was to stay. She had been writing to me in Austria, inviting me and telling me how nice it was going to be to have me stay there. Now it all seemed so different, slowly my heart began to sink. Everything felt different; I didn’t speak much English and felt lost. Christmas two days away, I could hardly believe it – before I left home I promised my mother that if everything was to my liking I would send a telegram saying “I arrived VERY WELL” , otherwise just saying “I ARRIVED safely”. In spite of misgivings I said “VERY WELL”, at least I wanted them to be happy. Christmas Eve and my thoughts were at home, and I cried many a tear, there was no feeling of Christmas – more people arrived and there was a lot of talk which I could not follow. I was glad some young girls arrived – they took me to see Gone with the Wind, my first film in England. Christmas over, there was still talk of us getting married. I had one paper missing that was from a priest in Austria saying that I was not already married in Austria but by the time that this arrived, almost three weeks later, the romance was off. 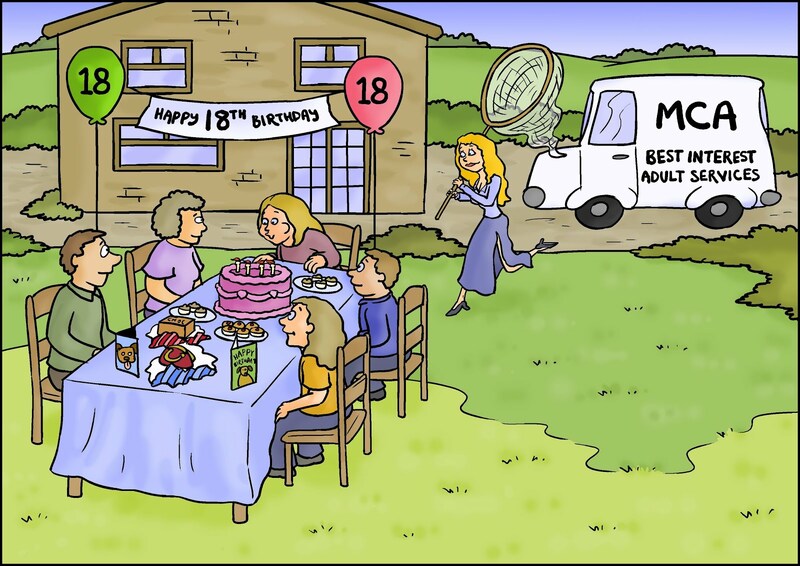 The man I was to have married had gone back to camp – and the man who would have been my brother in law took me to the alien’s office to see what I could do – apart from going back home. This I did not want – I would have been told “we warned you”. At the alien’s office I told my sad tale but, as they said, they had heard many such tales already. “For some weeks I hardly noticed Erna, my mind was occupied with writing and the need to earn some money. Her English was limited and my German was poor. I lived then in London and various shared experiences some happy and others less so at the time brought Erna and me together, and now always eager to see that smiling face in her weekly visit to London from her hospital in Reading. I used to be filled with a longing to see her and often could not wait for her arrival at the flat, but would rush off to Paddington station to welcome her off the train. I used to stand at the ticket barrier, watching for her figure, so lively and familiar, and I would hide until I could almost leap on her. I think I was going through the middle age crazy period of the male. Not only was there the fun of her presence, of making my daft jokes to her and having the pleasure of having someone to be tender to, but it seemed that within one hour she could bring order to the flat that I could not achieve if I stayed up all night. A conviction that no matter what the differences there were between us, our lives were meant to be together. Possibly a truer test of my devotion was the fact that on most visits I had been to the Lyon’s Corner House at the Marble Arch and bought her some fish or strong smelling cheese, I could scarcely bear the smell, let alone the taste, and standing at the counter waiting to be served I would think to myself You must be going off your rocker! Which in a way I suppose I was. So we had happy days and holidays together”. During my second year nursing, at one time Bill was not feeling well and as I had to go back to training school he said it was a pity that I should go and look after strangers when he was not so well, so he helped me to write my notice which I intended to hand in the next morning. I went to the Matron’s office, handed her my notice, she read it, looked up at me, asked what I intended to do. I knowing that she knew why I came to England and that my marriage did not take place, was too shy to say that I might get married now. I said I didn’t know what I was going to do, but nursing was very difficult – she handed me back my notice saying, “Nurse you are halfway through your training, the worst is over, if one day you get married and you don’t have to work, your degree will be like money in the bank.” I thought of that wise woman many times with love and gratitude. That evening I telephoned Bill and told him the outcome. He soon got the better and I carried on with my nursing. On one visit to London Bill had John Boyd staying with him. John worked for the BBC in Belfast and had come to London for an interview with the BBC in Belfast for a posting abroad. Bill saw John making a bad job of his shaving and suggested I shave him. I did, but did not tell Bill that the only man I had ever shaved was a dead man. I made a very good job, there was not a hair in sight, but John’s face was red for the rest of the day. Poor John did not get his job and I am sure he blamed my shave for it. I finished my training, came to London and was to start my midwifery training in three weeks. Bill suggested we should get married. This was in 1952. Because Bill, at the age of nineteen, had married his first wife in a Roman Catholic Church (they got married in the year that I was born and separated during the war, now she was married a second time) we could only get married in the Registry Office at the Caxton Hall in London. It was a very happy day, only eight of us. After a few days by the sea we came back to London and life for me really took off. I had to learn to take care of a husband, get used to housekeeping, but what was a little more difficult – Bill needed quiet to work and not constant chat from me. Often he would just raise his thumb for Yes or down for No. Anyhow I soon learned. He helped me and I like to think that I helped him a little too. In 1953 only four months after our marriage a friend and his wife went for three months to the south of France, and offered Bill a lift down. I went home to Austria to see my family, now I was the wife of a writer and this impressed my friends greatly. In the south of France Bill worked on a book called One Small Boy, he had not known what it was like to have such clear light and sunshine in the winter. After four weeks they all came to Italy, we met there and then drove back to France and stayed another two months. In London Bill continued on his book and wrote short stories – it made me happy that I was always the first one to read them, something which had not been thought of a few hours before. I remember one little story. A young Irish girl alone in New York on Christmas Eve, she searched for the only relations she had – she called at a large tenement block, nobody knew them. Suddenly she got the smell of bacon and cabbage, she followed the smell and there were her uncle and aunt. It reminded me of my own first Christmas in London, though without the bacon and cabbage. 1954 a dear friend from Limerick lent us a cottage on Achill Island – it was summer, we had several weeks, it was beautiful. Bill loved the peace and the loneliness of the place he continued to work on his book One Small Boy. I used to walk right against the Atlantic to do my shopping. I remember a farmer selling me cabbages, and when I asked him how much they cost he’d say “the price of a bottle of stout”, by the way I looked at him he quickly realised that I didn’t know it was nine pence. Then one day a lovely lady, near our cottage, stood outside her house and said to me, “I suppose you have no potatoes,” “No,” I said, “I am very sorry”, we had a little chat and I went on home. I told Bill how sorry I was not to be able to give the dear woman some potatoes and a few minutes later her little grandson came up with a big bag of potatoes on his back, saying how sorry his grandmother was that we should be without potatoes (it was June, the old ones had all been sold in the shops and it was too early in the year for the new ones). I learned the local way of speech and we were sorry to leave the little island. One day Bill walked up to Slievemore, took off his shoes, had a little walk round, couldn’t find his shoes again and had to walk down the mountain barefoot. 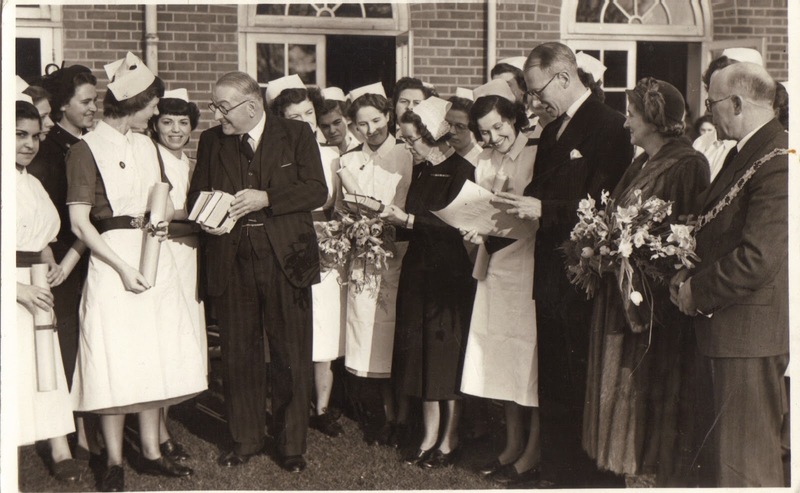 In London Bill worked and I started nursing again, often my thoughts went back to my Matron and her good and wise counsel, now I knew the value of my degree – it was a great help to me. We had good friends in London, some new, some old. Bill knew Frank O’Connor (I also remember him from my student days; Frank O’Connor spoke German and sang a German song for me and gave me one of his books of short stories – which I still have). Later he stayed with us often and there would be talk late into the night. Another frequent visitor was W. R. Rodgers, the poet who came from Belfast and who now lived outside London. He was a pale faced man, gentle and quiet with a lovely voice, a little hard to understand – for he could speak while he had the pipe between his teeth. Another dear man was Patrick Kavanagh – one day he came very late to lunch – we waited, but Bill said perhaps something more exciting has come up for Paddy and so we started – when Paddy arrived, we were eating apple pie, I went to get some meat for Paddy but he stopped me saying, “No, give me the pie first, I’ll have the meat dish afterwards for I hate getting from the table with the taste of sweet in my mouth”. As he told us, one day a publisher came to London and took him out for a meal. He asked Paddy would he like steak or chops? Paddy said “I’ll have the chops first and the steak afterwards”. These were happy days. In 1957, his book One Small Boy was published and reissued several times. In 1961, The Goalkeeper’s Revenge was published and reprinted for the twenty first time in August 1993. Soon Bill began writing plays for the radio and life became easier, the plays were well received. One day a friend from Bolton visited us with his wife and two sons. One son, just down from Oxford, was Irving Wardle, who became a Theatre critic for the Times. In 1960, Bill had a play June Evening, set in Bolton, on television. Bill got in touch with her and he remembered her well. She showed him the school register and he was able to tell her where most of the other boys worked and lived. In 1963, Bill had his first stage play produced at the Mermaid Theatre which was run by our friend Bernard Miles. After many changes of the dates it eventually went on. Our dear friend, Irving Wardle, was there as the drama critic for The Times. Bill and I sat almost at the back and he said, “We’ll be the first ones out and away”. The play went wonderfully, the audience loved it and at the end there was a call for the author. Bill shyly went on to the stage and thanked the audience, the actors and all involved in the production. Next morning he went to Victoria Station to get the papers. He was rather a long time; he had bought all the papers, sat down and read every one. We could hardly believe it, one better than the other, the telephone hardly stopped ringing for days with calls from the Continent, America and many other countries. They all wanted to perform All in Good Time. Many did. The play transferred to the West end .A few weeks later Alfie went on at The Mermaid, a lovely Shakespearean actor, John Neville, took the part. He told Bill that having done Shakespearean and Greek tragedy he was not used to getting such laughter and he loved the part. This too was transferred to the West end. When Bill saw his name in big letters he was reminded of his mother’s plea, “Whatever you do, try and keep your name out of the papers”. We took no papers and no television. One day Bill had a play on television; he thought he’d go to Mooney’s the Irish Bar in town, he never went to bars except if someone came and wanted to see the place, but whenever he was there they’d have the television on. That evening, as soon as the play came on, the barman looked up and said, “We don’t want this on”. Bill came home and we had a good laugh about it. Bill was a poor sleeper and often would get up two or three times during the night, so I always made sure that his table had the work all tidy with pens and paper. After this another play went on at The Mermaid, Spring and Port Wine, another successful production, this too went to the West end and ran for over three years. I had by then given up nursing; unfortunately I developed TB. After two years of medication, thank God all was well again. Over the years we had some lovely long holidays in Austria with my people, but he found Austria too beautiful and too relaxed for him to work. In 1966 Bill was awarded The Writers Guild of Great Britain Award for best screenplay for Alfie. He was nominated for an Academy Award of Merit in Los Angeles in 1967 and was awarded The Writers Guild of Great Britain Award for the Best British Comedy Screenplay for The Family Way (called firstly All in Good Time). Another dear friend we had was Gerald Dillon, the Belfast painter, and a lively and lovely man. He would often sing The Lark in the Clear Air and She Moved Through the Fair, great favourites of Bill. There would be lots of laughter and talk of Ireland, for he was a great storyteller. It was near Christmas, 1915, and there was great excitement in the home, it was early morning, he heard his mother had had a little baby boy, there was no time for him and he couldn’t dress himself very well, nor could he fasten his shoes and worse he was late for school, he arrived late. The Schoolmistress asked him to put out his little hands, which were cold and frozen, and with all her force she brought the cane down on them. He said he had never cried so much in front of strangers, his tears would not stop. Just at that moment Sister Edwardine came into the classroom. Seeing poor Bill she asked the teacher what it was. She said he was late. 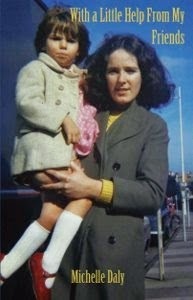 The Sister asked Bill why and Bill told her that his mother had had a baby that morning and he couldn’t fasten his shoe. As he said, “I was by nature a happy boy with the temperament of an optimist, but the uprooting and the change took a long time for me to accustom myself to”. On the Isle of Man it was peaceful and Bill could work. He loved working in the garden, growing potatoes, and if we had a mild winter he would try to have them in by St. Patrick’s Day; as soon as a little leaf appeared he would tend to it carefully; earthing them up and protecting them from frost. Then the excitement when he could pick one lot and boil them on his birthday, the twelfth of June. In 1973, Bill wrote a play, The Mystery; it was a special commission by the BBC. It was based on a dream Bill had. I remember well how it had frightened him. The play went on and eventually got The Italia Prize (that which the BBC chooses as their best drama entry for the year). One afternoon someone phoned from the BBC telling Bill that this year he had won the prize and not to tell anyone for it was still a secret but to prepare for a trip to Sorento ; but when they phoned back Bill kindly declined the offer. He told them he was in the middle of some work and this interruption would break the flow, that we didn’t like to leave the dog and what was more important that his potatoes needed to come out. I felt that the BBC never had such genuine excuses. So the Director accepted the prize on Bill’s behalf. “Something has been worrying me”. “Well, supposing there was a ring at the door and there was a man there saying, your wife or your dog”. “Well”, he said, “you’ve taken a great weight off my mind”. “The next morning nurses came and greeted me cheerfully and began to give me my bed bath. Somehow I had forgotten that young women were so lovely . . . for it seemed that I had not seen such a face close up for many years. ‘Roll on your right side, love,” she said, ‘and let the nice nurse wash your handsome part’. I rolled over and closed my eyes and felt the firm young hands wash and dry me. ‘Now put some powder on and make it look nice. There’s a crinkle in his sheet,’ she said, and with one tug she smoothed it out saying, ‘We don’t want to send him home with a wrinkle in his back’. I found myself turning to the pillow to hide the grin which was spreading all over my face . . . it was all I could do not to burst out laughing . . . a quick sense of relief came over me, for these two nurses had let out a hint of something, one worth more than all the drugs and I thought to myself, I feel I’m going to be alright this time, I am in good hands. This is not how they would treat a dying man and nurses get to sense these things. And in that moment I breathed easier and there came to mind that living speck of God that is within each one of us, the one per cent of God. I could vaguely recall or rather just feel those simple words of Thomas a Kempis, ‘If thy heart were sincere and upright, then every creature would be unto thee a living mirror, and a book of holy doctrine’. And such as it was with me, lying there not quite wholly alive. The laughter from the nurses inspired some good and holy feeling in me. From now on, I told myself I’d try to give thanks for every day that came . . . I felt with luck and the help of God that I might at last finish my life’s work . . . the book on the Dream Mind. Then about two o’clock my darling wife, Erna, arrived. She was loaded with delicacies and other things . . . soup in a flask, orange juice in another, cake and even one of our own boiled potatoes. I felt happy and we chatted away. A feeling of weakness came over me. After my dear Erna had fixed my pillows I lay back. I told her not to come that evening, as I lay there, sorely regretting I had told Erna not to come, and hoping that she might decide for herself as she does at times, there came over me a most melancholy loneliness and self-pity. A few days later I was sent home, collected by my dear wife – it was such a joy to be in familiar surroundings”. In 1987 On the Pig’s Back was published and got very good notices and was awarded The Portico Prize (the best non-fiction entry for the Northwest of England). He was invited to the presentation and agreed to go to Manchester. He said to me, “I suppose you wonder why I refused to go to Sorento but I am going to Manchester”. A friend told Bill that he was approached by a University to find out whether Bill would accept a Doctorate – Bill declined. The 27th February 1987 was a very special day for us, a friend, Father Gerald Hurst, came to dinner. Bill was at that moment not in the room when he said to me, “You know, Erna, in the eyes of the Church you are not married and now that Bill’s first wife has died (by then she had married three times) you are really living with a widower”. This did not seem very romantic to me and I asked our friend to talk to Bill about it – somehow that evening it was not mentioned again. Later, I told Bill about it, “Oh, yes, I’d be very happy; also when I die I can be anointed”. So we were married and it did take on a special meaning. The same year Saintly Billy was published and what made Bill happy was that the lovely Dervla Murphy gave him such a good notice. Sadly that winter Bill had another coronary attack and thank God he got well again. In 1988 The Institute of Higher Education awarded Bill an honorary Fellowship in recognition of his outstanding contribution to aspects of academic and public life valued by the Institute and the local community. It was the first Fellowship to be awarded. Bill was now working on the Dream Mind. His last two plays for radio were called Derby Day 1 & 2 – they were produced in June 1991 and great to listen to together. It was a very warm summer, the poor man found the heat too wearying, sadly on September 17th 1991 he suffered a stroke, it was an awful shock. I knew that Bill would have been very unhappy to go to hospital and I had always promised that I would take care of him at home. I had a nurse come in the morning to help me and two strong male nurses came in the evening to help with the bath. In spite of everything these gatherings were full of chat and laughter. For this I was very glad. Luckily it was Bill’s left side which was affected and this meant that he had his speech, for this I thanked God. We were able to talk and he listened to the radio, during the morning he would often listen to Gay Byrne on the Irish station. Another joy was that our dear friends John Boyd, Irving Wardle and dear Paddy Joe Tighe would telephone and could talk to Bill – Paddy Joe kept him informed about Ballyhaunis. In spite of his illness, I still said thank God that I could take care of him, give him what he needed and have him at home. On January 9th 1992 at 06.55am the dear man died. I had called our friend Father Hurst who had married us and who had been coming every few days during the illness. About two hours before and in a clear voice Bill responded to him. God rest him, he would have been happy to know that I had a lovely Irish nurse to help me with the last duties. I know Bill did not care for funeral parlours and since the house is big enough, his coffin rested on his desk in his workroom where he had spent many hours, facing over the sea going to Ireland." I'm so sorry for your loss Michelle, please do get in touch if you need to talk. Thanks Lesley! 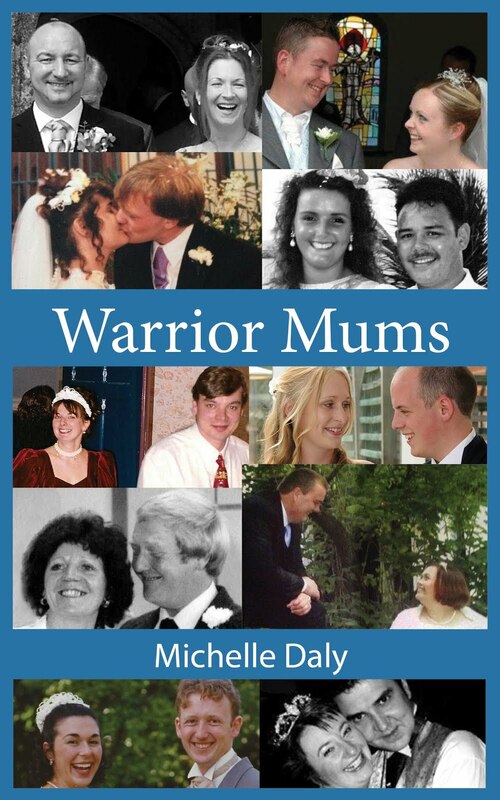 Erna read our Warrior Mums book when she went into hospital. After she came home I rang her to tell her you were on Alan Tichmarsh and she called me back after the programme to say how much she enjoyed it. 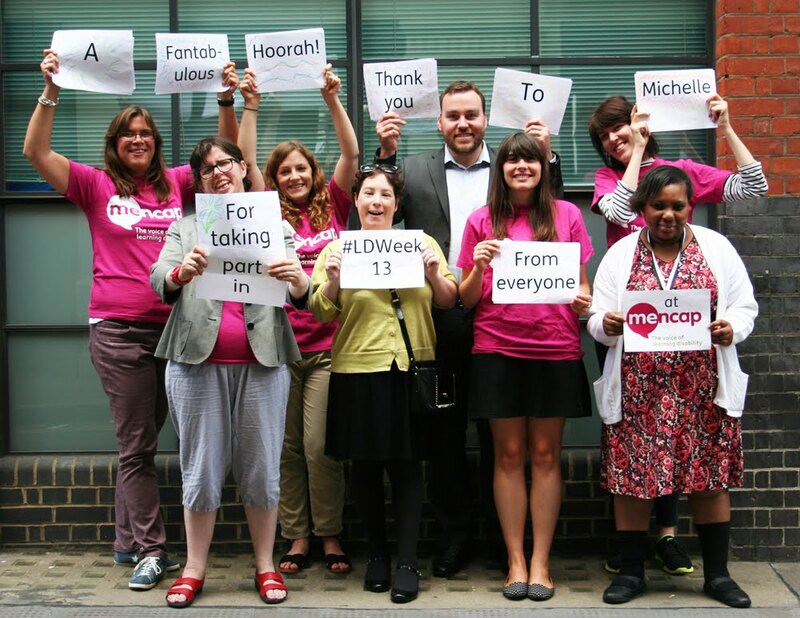 Michelle, I have just read your wonderful tribute to this remarkable lady. Thank you for sharing this inspiring lady's story. I would have loved to have met her. The world has lost someone very special. She was buried last Thursday 11/9/14 or 9/11 as the date is more commonly refered to. It was a gorgeous sunny day in the Isle of Man and such a lovely Service. I will miss her but she has gone to a better place and is with the love of her life. Thanks for dropping by to read and don't forget Erna knows all about you from Warrior Mums book. Sorry to see Erna leave us. The last time I saw her was in 1976 when I spent the summer working in a Parisian hospital. I visited her and Bill before returning to New York and finishing up my senior year of high school. Although I wasn't her biological grandchild she treated me as her own and I will always remember that wonderful summer with her and Bill in Eastbourne. RIP Erna. Hello Robert, I am sorry for your loss. Erna had fond memories of you too that she shared with me a few years ago. How lovely for you to have had such happy times with Erna and Bill and they in turn must have been delighted with your company. I'm sure she'd be delighted that you stopped by to pay tribute to her. She was loved by many and will be missed. True words indeed and I'm all the better for knowing such a wonderful woman. I have enjoyed viewing photos on your website but was unable to find translation app. Will try again after a while. Thanks for stopping by and so glad you enjoyed reading about my friend. Thank you Michelle for a wonderful tribute to a truly charismatic person. I am sure you will miss her so much. Erna was a loyal and great friend to St Peter and Paul's school. Her final visit was with you and I will carry such happy memories of the day we spent with you both. The children always loved Erna's visit. Through the years we kept Bill's name alive in school. Erna loved to chat to the children about Bolton and school life. She went into every classroom with a huge smile on her face and bent down to the smallest child in Nursery, interested in whatever they were doing. At Christmas she wrote to the children to tell them about the birds in her garden and her cats. Each class always made her a card. Erna will indeed be missed this year. Rest in Peace dear Erna and thank you for enriching my life and the lives of St Peter and Paul's community. Philomena Tarkowski, retired headmistress of St Peter and Paul’s school, Bolton. 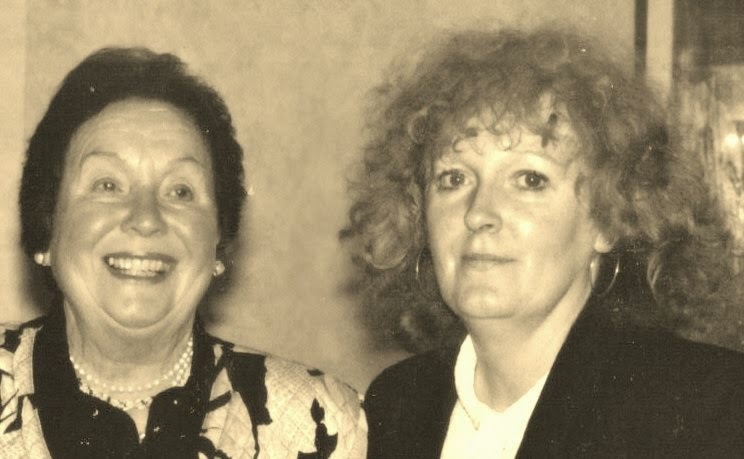 Dear Philomena, Thank you so much for sharing the memories. My original comment to you seems to have disappeared so I will try and post again. The Christmas post from the schoolchildren brought Erna to life and gave her smothing to look forward to. She absolutely loved getting all those cards and hearing news of the school. When you look at the photos of Erna on that last visit to you in 2012 you'd think they were stage set. I'm sure she won't mind me telling this story but a few weeks before her visit to Bolton she'd been saying how pale she looked so I sent her a tanning cream which was supposed to be applied once a day. When I met her off the plane I stifled a giggle when I saw the colour of her face, she'd obviously spread the cream generously and more often than she should have. In the school photo Erna's shoes, face and beautiful wooden throne she sat on, all blended in together, and that photo ended up being used used on the front of Erna's Mass card at her funeral service.